Travel theme: Endearing | Oh, the Places We See . . . It could be said, I suppose, that travel to any locale is endearing. And, to tell the truth, it is if you just love seeing something new. So on a recent trip to a friend’s ranch in Livermore, Colorado, with a group of women I’ve known since college days, I woke to watch the sky turn pink at sunrise only to find that the most endearing thing about those alone times was the chance to watch the hummingbirds. Oh, sure, we’ve all seen hummers. But for some reason, these birds swarmed — not just visited — two feeders — a blue Mason jar and a round red one — as if these sips/slurps were their last. And the birds were undaunted by my presence. Their colloquy continued whether I was inside the kitchen window or standing on the porch beside the hammock, camera in hand. I can only guess what social dynamics were at play among this “hummingest” group of not-always friendly flappers engaged in a feeding frenzy. Mornings became show time for the guests at the ranch as these endearing Rocky Mountain hummingbirds (both new and repeat diners) dipped into the nectar. You never know what your favorite take-back from a travel adventure will be, do you? For more entries into Ailsa’s Travel theme: Endearing from her blog “Where’s My Backpack,” be sure to click here. 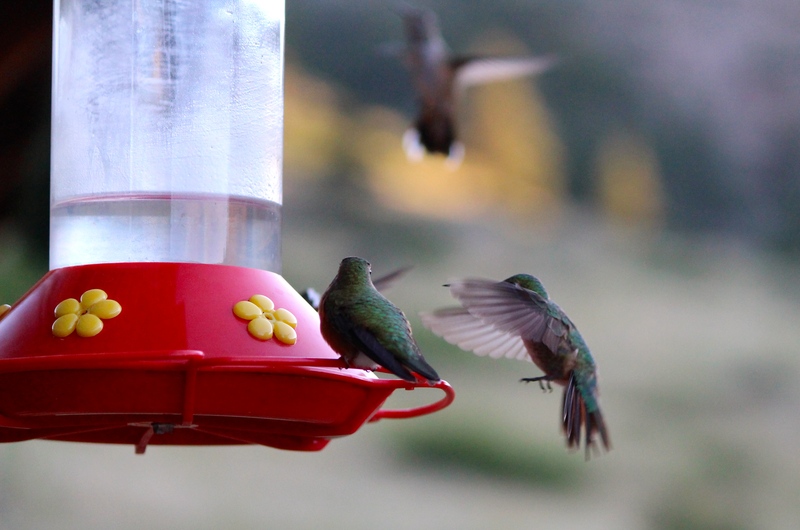 This entry was posted in Colorado, Photography, Travel and tagged Colorado, hummers, hummingbirds, Livermore, ranch, Rocky Mountains, Travel theme: Endearing. Bookmark the permalink. What lovely tints of green on these feathered friends. I never imagined they could have a pink neck as well. These pics made my day! Thanks so much for reading and responding. I loved taking pics of these birds so much! They made my day as well! Nicely done Rusha – hummingbirds are SO difficult to capture clearly. Great job! Thanks! I know there are better photos of hummingbirds, but no better memories than mine. 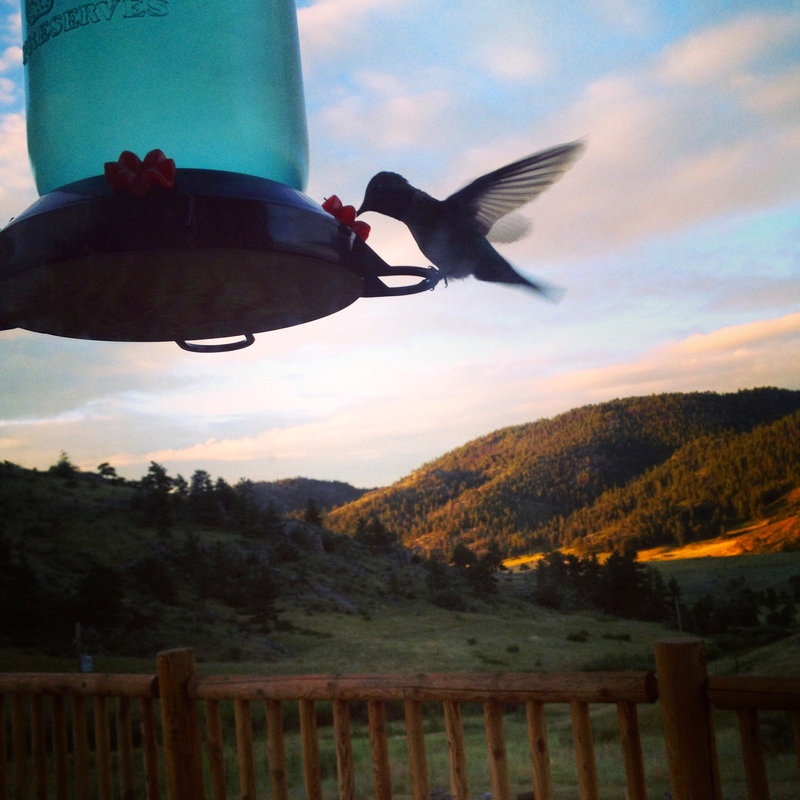 Loved beginning my days in CO on a porch with hummers! Thanks! I loved standing in my pj’s and robe for about an hour each morning focused on the sunrise, the hummingbirds, and a hot cup of coffee. Ah, the Western life!!! Oh I just love an adventure with friends! What a great place to bird watch. These images are amazing my friend. Thanks for this lovely comment. Coming from you — one of the photographers I most admire — this comment means a lot. Best wishes for finding more great shots each day! Such wonderful shots of these beautiful little feather folk. Thanks for the comment! It was a joy watching them and listening their loud (really!) hums! We don’t have hummingbirds, but I imagine they’re really hard to capture. These are gorgeous. We have a few hummingbirds in Knoxville, but not many. Because they let me stand there, I was able to snap away!! Thanks for commenting! Thanks, Kevin. I stood still about as long as I could each morning. Took dozens of pics and then found a few that were clear. I have a lot to learn, but I’m really having fun. Thanks for taking a look. The whole experience was great fun — just standing in my robe on the porch taking pics of birds. Who would have thought I’d do that! Great captures, Rusha. Beautiful colors. We will miss the hummingbirds. Thanks for replying. I have never tried to lure hummingbirds to my back porch in Tennessee, but now I want to! Hope there’s still some time left to put up a feeder. Thanks so much. The picture you like was taken with my iPhone! Sometimes the quick pics turn out best! My favorite summer aviators–really like the first one with the silhouette. Thanks for commenting. Would you believe it was taken with an iPhone? I’m determined to get a feeder up soon. It was sooooo much fun watching them and listening to the hum! Amazing shots!!! I love hummingbirds 🙂 its been a while since I saw the last one!